The international conference themed “The Building Integrity Initiative Day for Top-Level Leaders: Building Integrity as a Vector for Change” was held in Kyiv recently. Let us recall that the Building Integrity Initiative came into being as the result of a 2007 conference organized by the NATO Economic Committee during a meeting of the Euro-Atlantic Partnership Council (EAPC). The conference dealt, among other issues, with the connection between reducing corruption and increasing the efficiency of defense resources management. Within the framework of the EAPC, the building integrity project is carried out in accordance with the Action Plan which envisages activities in 10 different directions. It sets out main areas of these activities as follows: the development of an education module under the guidance of the UK, the development of a Self-Assessment Questionnaire under the guidance of Poland, and the Swiss-guided preparation of a Compendium of Best Practices. The participants of the aforementioned conference in Kyiv included a representative of Colombia, which became NATO’s global partner, the first in Latin America, this May, namely director of the Colombian War College Major-General Francisco Javier Cruz Ricci. The Day started conversation with him by asking why Cruz Ricci chose a military career and whether he regretted making such a choice now. Why do you see integrity and the fight against corruption as the most important issues, and why have these topics become so urgent now and in particular in the security and defense sector? “I think that the lack of integrity and corruption are linked. When we consider the lack of integrity, we think of an individual who does not have the qualities such as responsibility, discipline, loyalty. Therefore, he or she is a person who can easily be bribed and will commit acts of corruption since he or she does not adhere to the legal norms or ethical principles that a person must follow. “This is very important, since corruption has a negative impact by producing and strengthening social inequality. It also protects the network of complicity between elites where the corruption process is generated. To counter this problem, it is necessary to introduce a holistic governance approach involving all ministries and agencies where the creation and implementation of an anti-corruption strategy involves everyone. However, the fight against corruption must be carried out jointly and in the same way, based on the values and principles that are reflected in the activities of all those who are involved with the government. And how, in your opinion, can one measure overall integrity in certain areas? And what impact does your country’s culture have on integrity? What do you think about Ukraine in this regard, in particular, about integrity in its defense and security sphere? What recommendations, in your opinion, should be given to Ukraine for increasing or strengthening integrity in the defense and security sector? - To strengthen the organizational culture. - To strengthen military capabilities. - To enhance the technological transformation. - To create a military organization that would be reliable, modern, simple, flexible, fast, and deadly. - To strengthen the standardization procedures. - To establish a model of military education. - To use human talent and competence. Major-General, why was it important for Colombia to become NATO’s global partner, its first in Latin America? 1. Facilitating the exchange of knowledge and experience in combating traditional and non-traditional threats, based on close cooperation with NATO member states. 2. 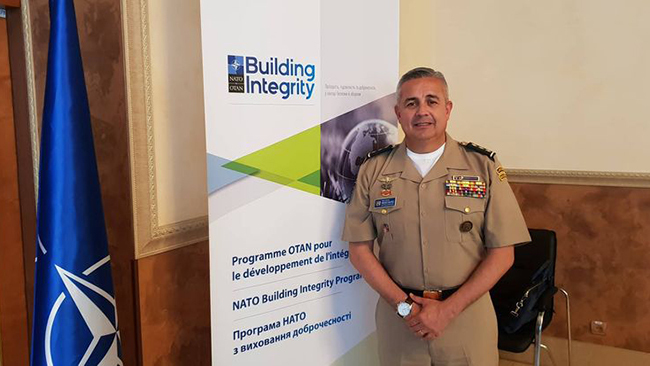 Participating in NATO programs such as the Building Integrity one to increase our legitimacy. 3. Increasing Colombia’s ability to influence the international system through multilateral channels and military cooperation systems (alliances). How easy is it to implement integrity in the defense sector of Colombia, given its decades-long struggle with the FARC? “Of course, it was not easy to achieve recognized transparency through the NATO Building Integrity program while our armed forces were 100 percent committed to defeating terrorism and bringing peace to Colombia. But we did it, even though it cost a lot of effort to the men and women of the Colombian Armed Forces. Today, we can show the world that we, the soldiers, have defeated the oldest terrorist group in the world that has agreed to join the peace process and that our processes that tax public resources are carried out transparently, giving the people of Colombia the legitimate armed forces they deserve. “Finally, security and defense are two key elements of a nation. It motivates us to work with other countries to limit risks, dangers or external and internal threats, in order to promote international peace and stability. The participation of Colombia in the NATO Integrity Program has enabled us to exchange good practice knowledge that we used to strengthen our integrity and transparency and focus on minimizing corruption in our military institutions. “To do this, we have created an organization that is subordinated to the highest level command. This organization is called the DANTE. This Spanish-language acronym stands for the Office of the Application of Norms of Transparency in the Army. The DANTE provides a preventive approach and is involved with all processes in our armed forces. Where are the promised surprises? What do Ukrainians know about NATO?